1. Is it true that Falun Gong practitioners have been killed as victims of live organ harvesting for organ transplants by the Chinese communist regime? 2. What is the real scale of live organ harvesting in China? 3. Did Jiang Zemin personally issue the order to perform live organ harvesting on Falun Gong practitioners? 4. Is it isolated acts by certain hospitals that are colluding with the military, police and judiciary systems, or is it a systematic crime committed by the state? China has one of the most secretive medical systems in the world. Since 2006, the Chinese medical establishment has shut the door to any external requests to investigate forced disappearances of Falun Gong practitioners and the nation’s transplant system. Meanwhile, China’s hospitals have not disclosed these issues on their websites. In the face of concerns raised regarding the many disconcerting phenomena existing in China’s transplant industry, Chinese Communist Party (CCP) officials that run China’s health system—among which Huang Jiefu is a representative figure—have collectively dodged the subject, flatly denied accusations, or attributed the organ sources to executed prisoners. After 2010, health officials started promoting voluntary organ donation in an attempt to provide justification and a humanitarian front to the nation’s transplant industry. Huang Jiefu declared in October 2015 that China has seen tremendous success in public organ donation, and that the nation’s transplant figures have reached the highest in its history. Since statistics produced in China are not reliable, often arbitrarily created to serve as political tools, it remains difficult to challenge these claims. We can, however. World Organization to Investigate the Persecution of Falun Gong (WOIPFG) was founded on January 20, 2003. Our mission is to investigate the criminal conduct of all institutions, organizations, and individuals involved in the persecution of Falun Gong. The second day after allegations were reported in the media that the Chinese communist regime was harvesting organs from living Falun Gong practitioners, on March 9, 2006, WOIPFG launched a systematic investigation targeting mainland China. As part of our continual effort over the course of the last 10 years, we’ve conducted tens of thousands of telephone investigations targeting 865 transplant hospitals, made multiple rounds of searches and analyzed hundreds of thousands of media reports, medical papers, cached hospital webpages and databases from more than 9,500 transplant medical specialists. WOIPFG’s investigation reached even China’s most senior leadership, including five standing committee members of the CCP Central Politburo, a vice chairman of the Central Military Commission, a committee member of the Central Politburo, a defense minister, and a former health minister of the General Logistics Department of the People's Liberation Army (PLA). Our investigation has made significant progress. As evidence of these crimes, WOIPFG has more than 2,000 telephone interviews, over 10,000 items of data evidence, and various published reports. In this report, WOIPFG has complied evidence from 60 recorded telephone interviews and 1,628 data items. In 1999, under the direction of former CCP Chairman Jiang Zemin, the CCP-controlled state apparatuses, including the Party, the government, the military, the armed police, the justice and the health systems, launched a genocidal massacre of Falun Gong practitioners in an organized manner through organ harvesting for transplant surgeries in China. This is a crime committed by the state, initiated by Jiang Zemin and carried out by the Chinese Communist Party. This is genocide and a crime against humanity. Conclusion One: Organ harvesting targeting Falun Gong practitioners is a systematic crime committed by the state, which was initiated by Jiang Zemin and led by the Chinese regime. Conclusion Two: The main source for the large organ bank in China, where living organs are sourced, is suspected to be the millions of Falun Gong practitioners illegally detained for petitioning for the freedom to practice Falun Gong. Conclusion Three: Six categories of evidence prove the existence of an enormous living organ donor pool in China. Conclusion Four: Instead of coming to an end, the CCP's live organ harvesting volume has climbed. Two time periods in particular saw organ-harvesting figures sharply increase. The CCP's claim made in 2015 that organs used in transplants come from voluntary donation has been discredited. Conclusion Five: Data analysis suggests that a startling number of Falun Gong practitioners have been slaughtered by the CCP for their organs. In the Reference Section of this report, all the webpages, medical papers and reports cited in the report shall be publicly released in the form of a WOIPFG archived Link for the purpose of in-depth research by interested readers. 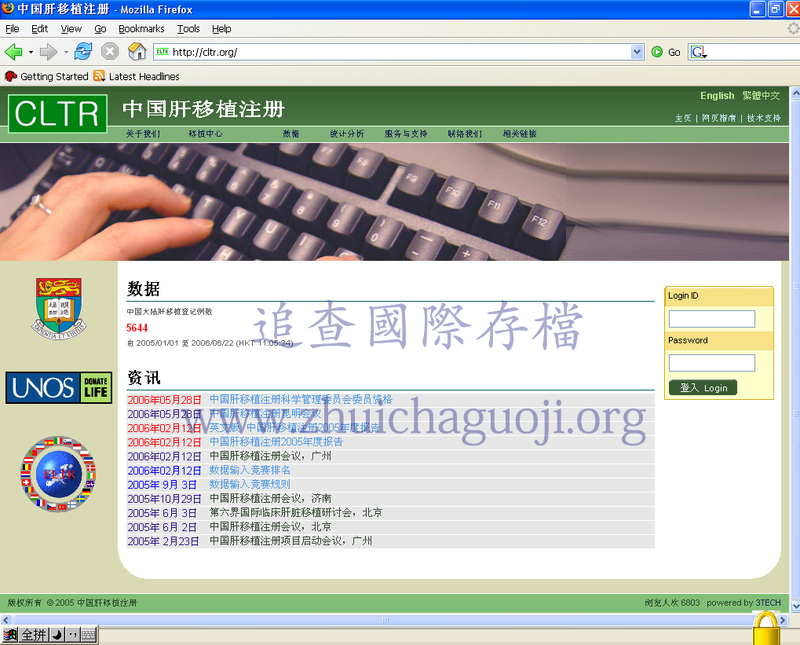 These links will allow readers to view images of the original evidence and directly download cached web pages and papers that stand in for the original data, which were lost as a result of the CCP’s cyber interference, tampering and removal of organ transplant information from its databases. Shortly after former CCP leader Jiang Zemin started the persecution against Falun Gong in 1999, tens of millions of Falun Gong practitioners were unlawfully arrested because their peaceful appeals, also called truth clarification, were treated as a crime. Several million Falun Gong practitioners still remain missing. At the same time, a surge of anomalies in the medical field appeared, with a drastic increase in organ transplantation surgeries and the swift establishment of a large number of organ transplant centers and tissue matching centers across China. South Weekend, a state-run newspaper in China, published an article in March 2010, titled “The Maze of Organ Donation: Visible Organs, Invisible Donors.” The article said, “The year 2000 marked a watershed in China’s organ transplant industry… The number of liver transplants in the whole country in 2000 was 10 times that of 1999, and by 2005, the number tripled from that in 2000.” If the article’s data sources are accurate, the number of liver transplant operations had increased 30-fold in 6 years. As of April, 2006, the number of hospitals capable of performing liver transplant surgeries in China had increased sharply to 500, compared with just 19 prior to 1999. This was an increase of 20-fold from 1999 to 2006. By contrast, in the United States, which has the world’s best transplant facilities, only about 100 hospitals are equipped to perform liver transplants. In the more than two decades leading up to 1999, only 135 liver transplant cases were performed in mainland China, averaging 5 to 6 cases per year. During the 8-year period from 1991 to 1998, Chinese hospitals performed a total of 78 liver transplant surgeries, averaging 9.7 cases per year. By contrast during the 8 years from 1999 to 2006, an astronomical 14,085 liver transplant surgeries were carried out in mainland China, an average of 1,760 cases per year. This was an 180-fold increase in liver transplant surgeries, coinciding with the persecution of Falun Gong. Over almost 18 months, from January 1, 2005, to June 24, 2006, at least 5,644 liver transplants were carried out in China. After the crime of organ harvesting from living Falun Gong practitioners was exposed in 2006, at a time when the CCP was under close scrutiny from the international community, China conducted at least 4,231 liver transplant operations between June 24, 2006, and June 24, 2007. This was 436 times the average number of liver transplant surgeries from the period 1991-1998. (2010, Mar. 26). The maze of organ donation: visible organs, invisible donors. South Weekend.